An Upstate dentist has been charged with unlawful communications after being accused of telling a woman that he wanted to put a bullet in her head and “cut her like a fish,” according to an arrest warrant. 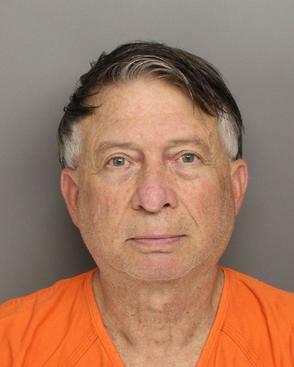 Robert Edgar Stark, 64, of 6208 Yellow Jasmine Drive, Simpsonville, also is charged with resisting arrest, simple possession of marijuana and possession of drug paraphernalia, according to a written statement from the Greenville County Sheriff’s Office. According to the warrant, the incident occurred Sunday, and Stark also is accused of threatening to burn down the woman’s house. About 4 p.m. Sunday, deputies went to Stark’s home to arrest him on the unlawful communication charge, and authorities said he became “very argumentative,” refusing to place his hands behind his back. When deputies escorted Stark to retrieve some pants for him to wear to jail, they found a homemade tinfoil smoking device that contained a small amount of marijuana, according to the statement from the sheriff’s office. Bob Mihalic, governmental affairs coordinator for Greenville County, confirmed Stark performed dental work on a contract basis for that county’s detention center. That contract, he said, is under review. The Motion Picture Licensing Corporation (MPLC), an independent copyright licensing agency, is introducing an umbrella license for pediatric dentists that will allow them to show movies and children's programming in their practices in a compliant manner. The American Academy of Pediatric Dentistry (AAPD) is among the first to partner with MPLC to offer this license to its members. Through their agreement, AAPD members can obtain the umbrella license at a discounted rate, the academy noted in a press release. Once a license is secured, pediatric dentist office administrators can rent or purchase movies and play them in their exams or waiting rooms without any further reporting. Colorado’s senior citizens have something to smile about. Gov. John Hickenlooper stopped by the Sister Mary Alice Murphy Center for Hope in Fort Collins on Tuesday morning to sign into law a bill that will provide dental care assistance for Colorado residents age 60 and older. House Bill 12-1326, sponsored by Rep. John Kefalas, D-Fort Collins, will provide funding for dentures, partials, extractions, fillings and cleanings for Colorado residents who qualify for dental assistance. “There’s a lot of research that shows we could reduce health-care costs by providing better dental care,” said Eileen Doherty, executive director of the Colorado Gerontological Society. Prudential Financial, Inc.'s (NYSE:PRU) Group Insurance business is now offering Dental Insurance in all 50 states. With the expanded offerings of three networks, each with different strengths and regional presence, employees have access to 190,000 provider locations for their dental care, allowing them to choose the dental provider that best meets their particular needs. "Employees consistently rank dental coverage as one of their most valued benefits," said John Rice, vice president, Product Management for Prudential Dental. "We're very proud of our ability to bring dental coverage at an affordable price to small businesses throughout the country. Prudential Dental is an especially good fit for small businesses when bundled with our other products -- life, disability, and long term care insurance. In fact, more than 30% of our dental clients have already bundled their plans with our life and disability products, to provide their employees with a compelling and competitive benefits package." With both PPO and Indemnity Plans, Prudential Dental is supported by the nationwide provider networks of DenteMax, CAREington and CONNECTION Dental, along with the 4Most Network in West Virginia and surrounding areas. The CONNECTION Dental Network was added to the Prudential Dental product on May 1.